Streets of Rage 2, Sega's answer to Final Fight follows the story of Mr. X, who returned from the first game to turn the peaceful city once again into a war zone. Chaos will reign in the streets, far worse than before. 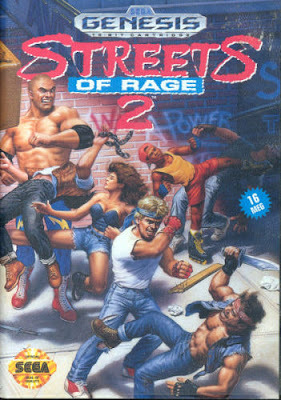 Streets of Rage 2 is a major improvement over Streets of Rage 1. Characters were made bigger, better detailed and with more animation frames and scenarios are less blocky. It features much longer levels. and the special attacks are what really distinguish this game from its predecessor. They are probably the best addition to the game as they take it beyond a just punching and kicking moves. On the Wii gameplay is straightforward and simple. Levels are in typical arcade side-scroller fashion: move from left to right, with a few exceptions. To me, the gameplay is still amazing after nearly fifteen years. Not downloading this game would only be a mistake, considering more than half of the game released for the Wii VC aren't anything spectacular.